Why is There Such a Choice of Anti Spam Software? If you are looking for anti spam software, you are hardly lacking in choice. A quick search of the Internet will reveal hundreds of service providers and software vendors offering a wide selection of options. But why is there such a choice of anti spam software? And, why is it necessary anyway? To best explain why there is such a choice of anti spam software, we shall answer those two questions in reverse. The reason why anti spam software is necessary is to better protect networks from email-borne threats. Although most mail servers have some filtering mechanisms, they are usually not efficient at detecting spam emails because it is not their primary function. With spammers becoming more sophisticated in the methods they employ, it is important that business networks have better than default protection. The reason why there is such a choice of anti spam software is because businesses have different motives for filtering emails. Many businesses consider online security their primary concern, but a business that has never been victim to a phishing scam or malware attack may want to reduce spam in order to reduce the amount of time spent dealing with it, and increase productivity. Anti spam software has different deployment options (software-based filtering or a cloud-based anti-spam service), different levels of versatility, and different mechanisms for detecting spam. Each of these options can have advantages and disadvantages, depending on the business´s point of view. Sometimes certain advantages outweigh the disadvantages, and occasionally the disadvantages are misunderstood. One of the best examples of how advantages can outweigh occasionally misunderstood disadvantages is greylisting. All anti spam software has filtering mechanisms that detect spam emails sent from IP addresses known to have previously been sources of spam emails, phishing scams and malware attacks. Greylisting is a process that helps identify spam from previously unknown sources. The way in which greylisting works is to reject every inbound email and return it to its outbound mail server with a request for the email to be resent. Spammers´ outbound mail servers are often too busy sending out more spam emails to respond to the request, so the rejected spam email is never returned. This process can elevate the software´s spam detection rate to almost 100%. Although this may sound like a fantastic advantage to both security-conscious businesses and those who want to increase productivity by reducing spam, there is a disadvantage in that the greylisting process can take up to five minutes and may delay the delivery of business-critical email. Some businesses can live with the delay, others can´t. The reason we feel the disadvantage is misunderstood is because most anti spam software has a whitelisting facility. This facility enables administrators to whitelist trusted email addresses so they bypass the process. Unfortunately with some email filters, whitelisting is not a straightforward process. On SpamTitan´s anti spam software, it takes the click on a mouse to whitelist a trusted email address. SpamTitan has many features that businesses will find valuable in the fight against spam. Recipient verification and web authentication tools are supported by Sender Policy Frameworks, Reject Unknown Sender Domain tests and HELO tests. Acceptable spam thresholds can be applied by individual employee, groups of employees or business-wide, and you can also blacklist specific email addresses. All inbound and outbound email is scanned by dual antivirus software to block emails harboring malware. Outbound scanning can be particularly important to identify compromised email accounts that are used by spammers for bulk-sending spam mail, and to detect internal viruses that may have been inadvertently introduced by an employee transferring a file from a malware-infected home computer. The consequences of a spammer compromising an internal email account, or malware being distributed by a business´s mail server, can be significant. These scenarios can lead to the business´s IP address being blacklisted by global blacklisting agencies, and this may not only affect the business´s ability to send and receive emails, but could also affect its website and access to it by the public. There are many more features of SpamTitan´s anti spam software that may or may not be relevant to businesses depending on the business´s motives for filtering emails. We recommend system administrators looking for effective and versatile anti spam software contact us and discuss their requirements with our team of Sales Technicians. When you have discussed your requirements with our Sales Technicians, you will be invited to experience the best spam detection rates in the industry by taking a free trial of SpamTitan. Knowing a little more about your requirements, our team will suggest either a software-based or cloud-based solution – both of which take minutes to implement and configure. You will then be able to evaluate SpamTitan in your own environment to experience the advantages of its high detection rates while ironing out any perceived disadvantages you encounter. By the end of the free trial, you will have found the optimal settings for your requirements and, should you subsequently continue using our software, no further adjustment will be necessary. The increase in phishing threats, rapidly evolving malware, and the current ransomware epidemic mean organizations need to greatly improve email security to ensure these threats do not reach end users’ inboxes. Organizations that fail to implement layered email defenses and do not use a dedicated, third-party spam filtering solution will find that a significant number of these email threats will reach end users’ inboxes. 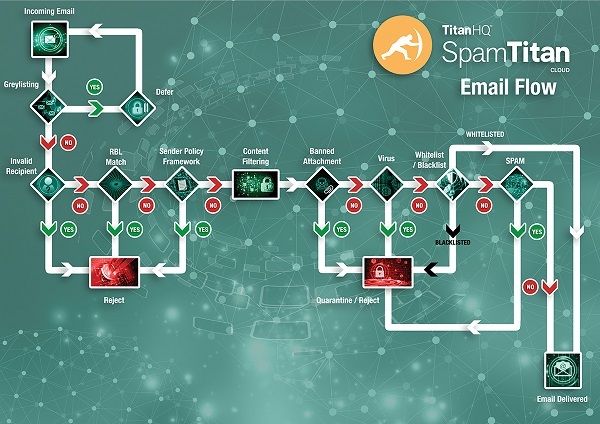 SpamTitan uses a variety of methods to assess incoming emails and determine whether emails should be delivered, quarantined or rejected. These assessments ensure a detection rate of 99.97%. Office 365 has many built-in security features; however, for organizations accustomed to dedicated security solutions are likely to be underwhelmed by Microsoft’s default security offering. The key to improving Office 365 security is using a dedicated third-party spam filter on top of Office 365. By adopting a defense in depth approach it is possible to block new varieties of malware, spear phishing attempts, and zero-day attacks and ensure that these sophisticated new threats do not get delivered to users’ mailboxes. 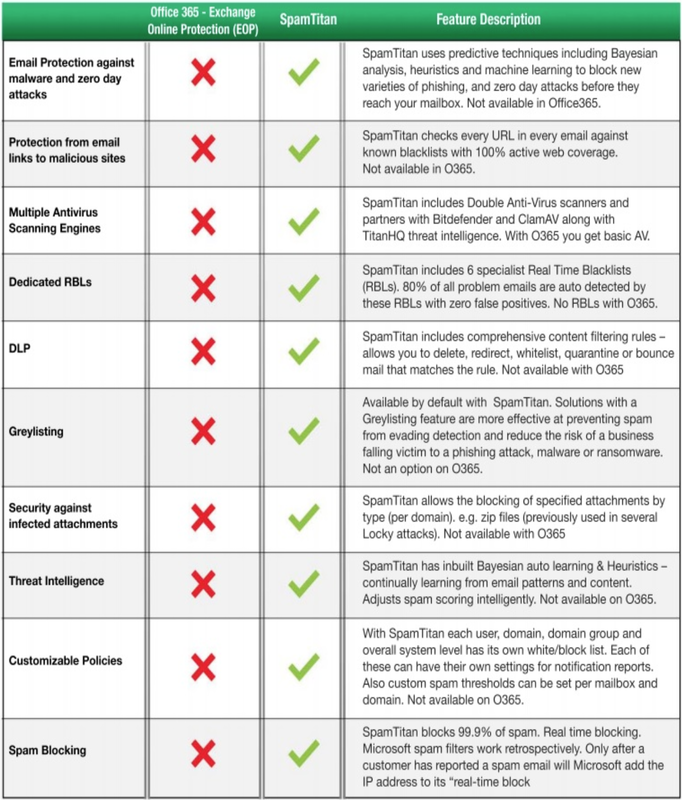 SpamTitan uses a range of predictive techniques to identify new threats such as SURBL filtering, Bayesian analysis, heuristics, and machine learning, which significantly improve detection of email threats. Malicious URL detection mechanisms maximize the probability of phishing emails being detected, while dual anti-virus engines (Bitdefender + ClamAV) inspect the content of inbound emails and their attachments for malware and ransomware.